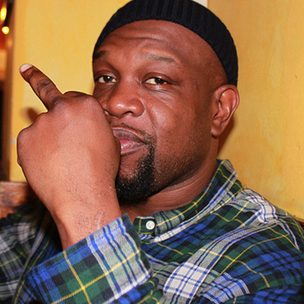 It has been over five and a half years since Brooklyn, New York veteran emcee Jeru The Damaja has released an album. The onetime Gang Starr Foundation/Ill Kid Records front-runner has also been scarce on guest appearances, though he notably reunited with Lil Dap and Melachi The Nutcracker on the title track to Group Home’s Gifted Unlimited Rhymes Universal 2010 album. While touring in London, England this week, HipHopDX had the opportunity to ask Jeru a few brief questions about his current happenings, as well as his five favorite Hip Hop albums. Touring with Afu-Ra, Jeru was asked about the partnership the two have maintained for nearly 20 years, with Afu’s breakthrough “Mental Stamina” appearance on The Sun Rises In The East. Touring with the former D&D Records protege, Jeru noted, “[Afu-Ra] is more than a friend. He is a brother, and will always hold that place in my heart and mind.” Like Jeru, Afu has been relatively quiet since 2005’s State Of The Arts album on the then-fledgling Decon Records. To his own limited appearances, Jeru explained, “I just come from the school of rockin’ with people you respect or are down with. [I believe in that more] than rocking on records for the hell of it.” In addition to “G.U.R.U.,” Jeru did make two appearances on Ill Bill’s Black Metal project, an introduction to La Coka Nostra, in addition to work with Big Lou and DJ JS-1. Slim on details to his own sixth effort, Jeru stated, “[I’m] still working on it I have a lot of tracks done but I want it to be perfect.” It was previously reported that he was working with the likes of Large Professor, Pete Rock and an anticipated recording reunion with DJ Premier. Jeru did not update on those details. Lastly, The Dirty Rotten Scoundrel was asked about his top five favorite Hip Hop albums. ‘Ru began listing EPMD’s acclaimed 1988 debut, Strictly Business. The gold album was a blockbuster for Fresh/Sleeping Bag Records, though it famously debuted at #80 on the charts. Highlighting another 1988 debut LP, The Damaja put a spotlight on Slick Rick’s The Great Adventures Of Slick Rick. 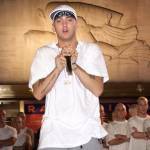 The Bronx, New York emcee would later become label-mates with EPMD at Def Jam Records. The five-mic effort remains Rick’s most celebrated album within his own famously limited output. Keeping things in the Bronx, Jeru also highlighted Boogie Down Productions’ 1987 debut full-length, Criminal Minded. The album was the sole B.D.P. effort to be released while deejay Scott La Rock was alive, before his tragic murder the same year. The effort famously included early and uncredited production by The Ultramagnetic MC’s own Ced Gee. Next, Jeru chose an album made by a critical member of B.D.P.’s onetime rivals, The Juice Crew. Kool G. Rap & DJ Polo’s 1989 debut, Road To The Riches was the emcee’s fourth choice. The Cold Chillin/Warner Bros. Records album yielded multiple singles, including “Poison,” which was famously sampled by Bell Biv DiVoe one year later on their platinum single of the same name. Keeping things in the family, Jeru chose an album that was not a debut by its makers, but remains his introduction to the masses. 1992’s Gang Starr album Daily Operation rounded out The Damaja’s picks. The Chrysalis/EMI Records release was Gang Starr’s third. Guru and DJ Premier invited Jeru and Lil Dap to appear on “I’m The Man.” The song would notably re-appear on 1999’s Full Clip: A Decade Of Gang Starr compilation, which was certified gold. Those in the London area can purchase tickets to see Jeru The Damaja, The Beatnuts and Afu-Ra and more at the Garage on May 25.